Confiding is the lifeblood of intimacy, yet many – including loved ones – stop confiding because of the reactions and responses of others. As a result, we can lose the potential of our interactions with those who matter most in our lives. For many, the most meaningful gift we can offer is the gift of listening with empathy, with our heart. Learning to listen with empathy to those closest to us is a gift that offers a lifetime of rewards. Consider how often you really listen to another person; not just to their words, waiting for a chance to insert your own thoughts, experiences, and perspective, but to the rhythm, meaning and intention beneath the words? Listening with empathy begins with being fully present to another person, surrendering – at least momentarily — your own ego, including the temptation to interject, judge and give advice that isn’t invited. It’s also about separating ourselves from distractions – not just television, iPods, cell phones, text messaging, laptops and the like, but also from the wanderings of your own thoughts and prejudices that can get in the way of truly hearing another person. It’s a commitment to listen to understand another person’s feelings and experiences. Especially during times of stress, anxiety, and uncertainty, there are few gifts we can offer that are more enduring and meaningful than listening with empathy. Every parent and child deserves to understand the most basic lessons in emotional literacy: that painful, upsetting emotions held inside eventually either implode or explode. That may go against our natural inclination to tell our sons not to be mad, sad or scared when, in reality, they are. The intensity of those feelings grows only stronger when they’re held inside, eventually demolishing the opportunity to experience joy, love and compassion along with the ability to think clearly and rationally. For most, learning to release painful emotions doesn’t require therapy, counseling or medication. It does require loved ones who can listen with empathy – with a sense of what it’s like to be in the other person’s shoes – regardless of whether they agree with the feelings confided. The formula for helping bring relief to a loved one experiencing emotional turmoil can be understood by a child, as I’ve seen firsthand from experiences in elementary, middle and high schools in some of America’s most vulnerable and violent communities. How do you know if someone you love is experiencing emotional turmoil? If someone is imploding, that looks like sadness, depression, and at the extreme, suicide. If someone is exploding, that looks more like a never-ending short fuse, rage, and at its extreme, violence towards others — most often those who are closest. Leaking can be passive or active. 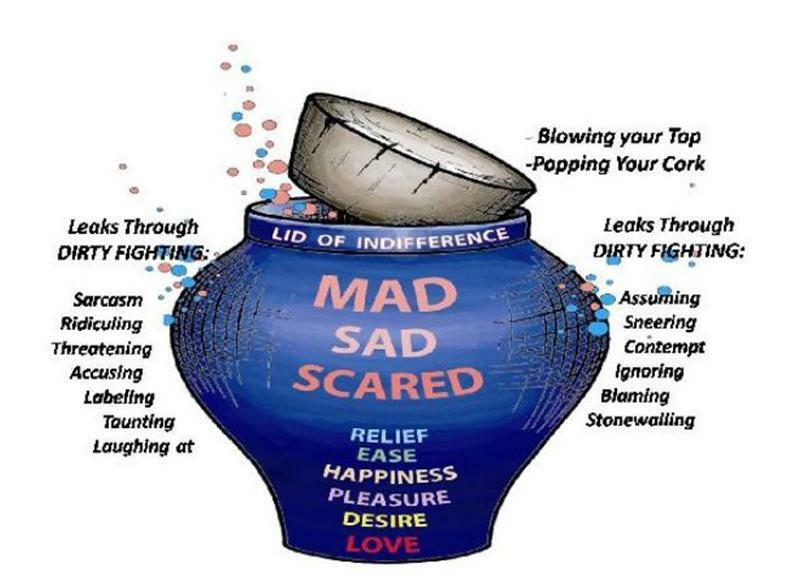 Active leaking can come out through actions such bullying, blaming, accusing, threatening, taunting, or labeling. Passive leaking can show up as acting like a constant victim or martyr, playing confused, lying, withholding, withdrawing or putting up a stonewall to isolate physically, mentally and emotionally from others. While some of these behaviors may seem all too common in homes, schools and offices, they are not signs of happy people. With the best of intentions, it can be easy to inadvertently make things worse for loved ones instead of helping them find relief. Thousands of times over, I’ve seen relief come from a friend or family member asking someone who’s upset a sequenced series of questions, fully listening to what they say, and simply thanking them for confiding. That means setting aside the temptation to judge, agree or disagree, interject, deny, distract, try to fix or solve, tell someone not to feel what he or she feels, ask questions, or bring the issues up later unless the person with the feelings wants to talk about them further. When doing this exercise with a child, the child should always be the Speaker and not the Listener. For couples, friends or others doing the exercise together, it’s important, especially when first learning the process, for the Speaker to avoid saying things that could feel like an attack or criticism of the Listener. This is an invitation for the Speaker to look deep inside to see and feel what’s in their gut that’s connected to feelings of ANGER and to express those feelings in words. It’s not a speech, lecture or conversation, but a chance to become aware of the feelings and say them aloud. As the Speaker confides, the Listener should stay focused on the Speaker’s eyes and words, listening much more with the heart than the head. After the Speaker has confided, the Listener says, “Thank you. What else are you MAD or ANGRY about?” The Speaker continues to look inside and give expression to whatever is there. This step is very important, as the deepest feelings may come out last. After the Speaker confides, the Listener says, “Thank you. What else are you SAD about?” The Speaker continues to look inside and express whatever is there. What are you SCARED or WORRIED about? After the Speaker has confided, the Listener says, “Thank you. What else are you SCARED or WORRIED about?” The Speaker continues to look inside and confide whatever is there. After the Speaker has confided, the Listener says, “Thank you. What else are you GLAD about?” The Speaker continues to look inside and confide whatever is there. The exercise ends with a tangible sign of appreciation for sharing and listening, which is often a hug. In memory of the children of Sandy Hook, the nonprofit PAIRS Foundation is giving away wallet cards with instructions for helping a loved one empty their emotional jug. To receive a free set of cards, send a stamped, self addressed envelope by January 31, 2013 to PAIRS Foundation, Sandy Hook Memorial, 200 S. Park Road, Suite 455, Hollywood, Florida 33021. Teachers requesting cards for their classroom should indicate the number of students and grade level. Seth Eisenberg is the father of three sons and President/CEO of the nonprofit PAIRS Foundation in Hollywood, Florida, an industry leader in marriage and relationship education. Super website. You have made a recent fan. Please keep up the fabulous writings and I look forward to more of your newsworthy updates.